NSRI’s Maitland store room was ransacked this afternoon, 16 October, by burglars who ransacked the premises after breaking through a double brick wall, apparently with a sledgehammer, to gain entry. Despite manned 24 hour security and electric fencing, thieves managed to elude detection and escape with medical supplies, splints, spinal trauma boards, boxes of branded NSRI uniforms, drums of oil, tools and boat propellers, among other items. The NSRI volunteer duty crew were activated by security guards after the alarm went off at 3.35 pm. Guards had immediately checked all windows and doors and found no sign of any attempted entry. NSRI personnel arrived to investigate and found on the far corner of the building, which has no windows and is essentially on the outside of the security complex, a knee-high hole in the wall. Police have opened a case of robbery and are investigating. Anyone with information that can assist the police can call the Maitland Police Station on 021 5069400 or 10111. 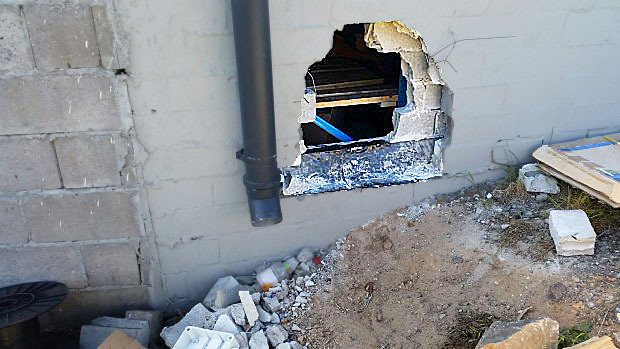 Tags : 16 October, apparently with a sledgehammer, by burglars who ransacked the premises after breaking through a double brick wall, NSRI's Maitland store room was ransacked this afternoon, to gain entry. This is disgusting…..Why the guys are out there doing the community a service and you steal from them….Take them for a boat ride…….